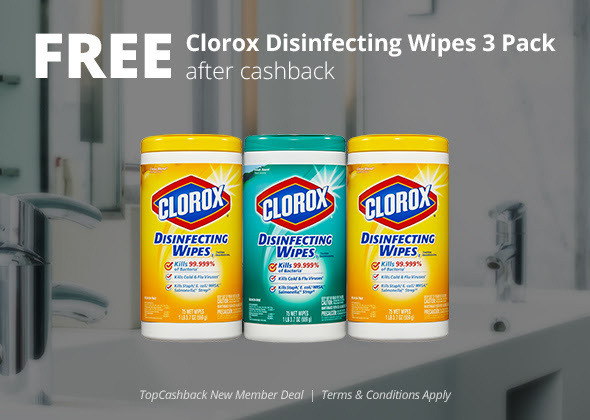 3) Add the 3-Pack Clorox Wipes for $10.64 to your cart and checkout. Within 14 days, your account will be credited with your $10.64 in Cashback, making this totally free! Please Note: Transactions must contain at least $10.64 worth of purchases to ensure the $10.64 cash back is credited to TopCashback accounts. Transactions may initially track lower, but within the 14 days after purchase it will be uplifted and turn payable at the amount of $10.64. Transactions may take up to 7 days to appear in your TopCashback account. The deal is open until 11:59pm PST on 01/13/2019 or until supplies run out; whichever happens first; applicable for purchases made directly after clicking through TopCashback. Only one TopCashback account is permitted per member. Cannot be combined with other TopCashback freebie offers. Thats a good deal, thanks. I’ve heard great things about Topcashback. I should really sign up. Perfect timing, I need to buy more. Thanks! clorox wipes are a great deal! This is a good deal,but I am already a member of Topcash.